Recently released by Shout! Factory, Dead Cert is a new cult film that crosses the British Gangster genre with the Vampire genre. Sounds like it could be really good or really bad. I was intrigued when I read the premise and the cast of cockney tough guys like Craig Fairbrass, Jason Flemyng and Danny Dyer made for what I would suspect to be worthwhile. Fairbrass plays Freddy Frankham, the owner of brand new gentleman's club who has a run in with some gang that turn out to be vampires. It seems that the club was built on sacred vampire land and after a bet, Freddy loses the club to head vampire Dante Livienko (Billy Murray). Freddy and his gang decide to get the club back, not knowing what they are getting themselves into. 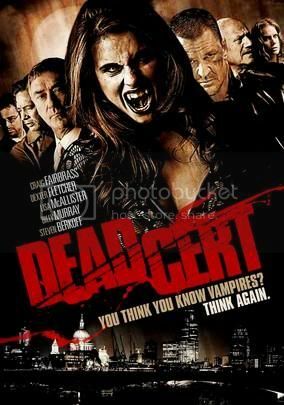 Dead Cert is a good mix of gritty British crime, similar to Guy Ritchie's films, and modern day vampires. The movie is stylishly filmed with lots of fast paced editing and decent vampire effects. The story is pretty simple but the performances of the lead actors make Dead Cert a lot of fun to watch. My only gripe with the film is that some of the characters are a little underdeveloped (especially the vampires) but I would still recommend the film to horror and crime movie fans.